A wall of smiling faces welcomes you to Fuji Japanese Steakhouse — photos of people you may know, a community of diners. While you’re here, you’re not a customer; you’re a guest, in the “home” of second-generation chef David Chen, and something for everyone is the goal, from menu to amenities. “The atmosphere is family friendly, with a community feel,” said Chen, who opened the Garner restaurant last summer. It offers seating for 280 diners, hibachi-side, at the sushi bar, and at booths and tables. When it comes to food, hibachi, tempura and sushi are the key menu concepts here. 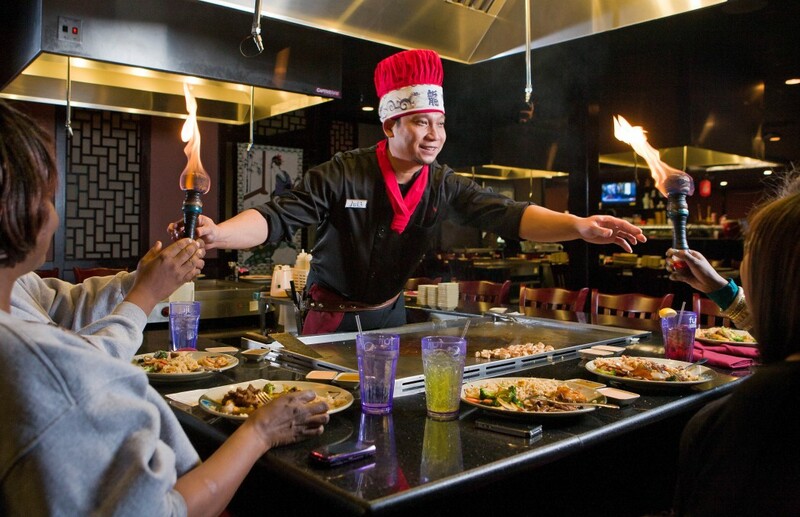 The flavors of hibachi-style entrees, whether steak, chicken or seafood, are most popular with guests, who enjoy flames-flying, ingredient-flipping shows by hibachi chefs at the grill. Deep-fried tempura dinner entrees are big hits too, along with sushi and rice-less sashimi. “Some people aren’t ready for raw fish; for them we recommend the California roll or tempura roll, all cooked,” Chen explained. Sushi roll buy-one-get-one deals offer the chance to try multiple varieties. While Chen, who is Chinese, recognizes the close relationships between many Asian foods, his 20-plus years of experience in Japanese kitchens bring special touches to his recipes. For example, the slightly spicy, seared Tuna Tataki, served with citrus-based ponzu sauce, “takes time, effort and heart,” he said. His secret-recipe homemade sauces also add spark to hibachi meals, and are popular as take-home purchases. Fuji’s menu features a wide array of dishes including the Fuji Seafood Soup, full of shrimp, crab, scallops, lobster and vegetables. Karashi Mixed is a spicy octopus appetizer with avocado and cucumber, and guests can build one of nearly 20 sushi roll combinations including the tuna-based Dynamite Roll, deep fried with eel sauce, or the caviar-wrapped, rice-free South Beach Roll. Bento lunch or dinner boxes provide a sampler of sorts, with options in teriyaki, tempura and sushi alongside rice, vegetables or fruit. Try batter-fried Banana Tempura as an appetizer, or an entrée of Lobster Tail Tempura, Samurai Steak at the hibachi, or Chicken Shogayaki, with Chen’s favorite side, soft udon noodles. A full bar offers cocktails, Japanese wines and beer; sakes are available hot or cold. For dessert, options include green tea or red bean ice creams, and cheesecake tempura. Fuji Japanese Steakhouse is located at the intersection of US 401 and 70; a Durham location is planned as well.